The yellow goldfish once illegal to keep, is a modern day splash! Goldfish from ancient times of course exhibited many color morphs such as gold, red, white, and even yellow. The keeping of goldfish was not an activity for common people and was only enjoyed by the aristocratic level of society. The keeping of the “yellow” goldfish was highly illegal being that yellow was the color of the ruling families. By the 1600’s being punished for keeping a certain color fish had relaxed a quite a bit. At this time the goldfish was introduced to southern Europe becoming wildy popular, and was even used as a traditional 1 year anniversary gift, later replaced by paper (boooring!). The popularity of the gold and red colored goldfish exploded at this time, and the yellow goldfish went below radar. Recently the yellow goldfish has made a come back in popularity, gaining common names of Canary goldfish or Lemon goldfish. The refreshed interest in yellow goldfish may even be helping to save the goldfish hobby which has been in a slow decline over the last several decades with competition from other aquarium fish such as marine varieties, and invertebrate aquariums; not too mention the “damage” that koi have done as koi popularity steadily rises for pond keepers who at one time would have never thought twice about whether they will keep goldfish or not, of course they would have! The first thing one notices about the Canary yellow goldfish is of course its bright beautiful true yellow coloration, but wait…there’s more! The yellow goldfish really stands out against any other color variety of goldfish and even holds up its visual interest against the increasingly popular koi. Secondly, the yellow goldfish has the same great qualities as the common goldfish. Yellow goldfish are very hardy and easy to care for, perfectly suitable for indoor or outdoor fish keeping, with an ideal water temperature around 70F. Also, the yellow goldfish accepts the same wide variety of foods that any other goldfish would accept, prepared flake and pellet foods are readily accepted along with treats like fresh peas and various salad greens. The yellow variety mixes well with all other variety of goldfish including some of the more exotic strains, and is a classic schooling fish preferring to be in large groups. Lastly, they become mature at about 1 year, and have a life expectancy of 20+ years; with some goldfish attaining 40+ years in captivity. With the increasing popularity of the yellow goldfish they can be found pretty easily at your local fish dealer or even a search online will yield some fish dealers who would be happy to ship your canary yellow goldfish right to your door! Like any new fish the yellow goldfish still needs to be acclimated to its new pond or tank. Quarantine them if at all possible, and watch closely the first few weeks for signs of stress or disease. Once the fish is established you can expect to enjoy your new canary yellow goldfish for many years! On a side note, if you happen to be living next to any Chinese aristocrats you may want to keep your yellow goldfish out of site… you never know!! Mike Gannon is owner at Full Service Aquatics located in New Jersey, USA. Being “In The Pursuit Of All Things Aquatic” has led Mike to be a lifelong hobbyist and fish enthusiast. 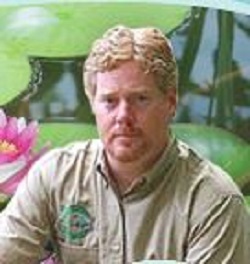 Mike began working professionally in the aquarium and pond industry in 1990. Full Service Aquatics started in 1995 offering all services, design, and installations of koi ponds, water gardens, and aquariums. Since that time Full Service Aquatics has become recognized for their designer pond installations, featured in publications, and winning awards within the water garden and pond industry. 14 Comments on YELLOW GOLDFISH, A LEMON OR A CANARY? Or maybe a goldfish could be the key to happiness! It’s probably for the best that we no longer give goldfish as one year anniversary gifts. Yes there is something about the yellows! …of all species! 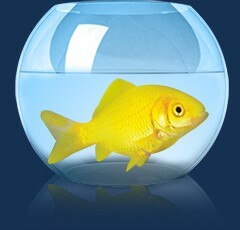 I would MUCH rather get a yellow goldfish for my one year anniversary over paper anyday. Not sure my girl would agree.